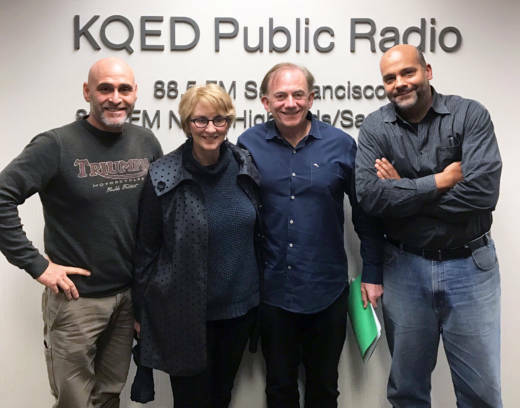 Since the election, many KQED listeners and readers have expressed concerns about our divided political climate, and the lack of civil political dialogue in their day-to-day lives. So we decided to create a space where these kinds of encounters can happen, without anyone being shouted down or feeling like they need to clam up. In short, we want to get folks talking face to face, even if they don't see eye to eye. We convened our first "Eye to Eye" panel on the morning after President Obama's farewell speech, and just a few hours after then President-elect Donald Trump's first news conference. We talked with our guests about how political discussions play out in their own lives, and asked the panelists about views on the other end of the political spectrum they'd like to better understand. Our first panel's guests spanned a political and geographic spectrum from within the Bay Area. Terry Shames comes to our studios from Berkeley, "with all that implies," she adds. "I'm a wild-eyed liberal and always have been." Terry is originally from Texas, and she still talks politics with family members in the Lone Star State who have views that span the political spectrum. "We have lots of conversations with lots of arm waving and shouting and screaming," says Shames. "But we love each other in the end and that's what counts." Michael Wagner, a Republican from Palo Alto, gets to hear differing viewpoints a little closer to home. "My wife is a liberal Democrat and all our mutual friends are liberal Democrats," he says. "There is no discussion, it's a huge argument that usually stems from her saying 'Donald Trump is a racist,' Donald Trump is a bad guy,' 'Donald Trump is evil.'" Gary Wettstein describes himself as a "blue-collar Democrat." He joins the panel from Vallejo, where he says he gets to hear a variety of political perspectives at his work. "We've been having some heated discussions, but we end up being to joke at the end and we don't carry any grudges," he says. "But they've been very interesting since the election has taken place."